UKFT developed and introduced the Industry Recognition Programme (IRP) in June 2018 to ensure that qualifications are both applicable and necessary. As the Sector Skills Body for the industry, working collaboratively with members of the UKFT Awarding Organisation Forum, UKFT wishes to review course provision with the intention of recognition and promotion of the high-quality qualifications that will equip candidates with the skills to progress their career. Significant signposting is required to assist young people, employers, parents and training providers in navigating the range of available courses, particularly those that address the current skills gaps within fashion and textiles. UKFT’s Industry Recognition Programme offers a complete package; high quality qualifications which are identified, promoted and offered by fashion & textiles training providers and that have been assessed and endorsed by UKFT as being industry relevant. As the Sector Skills Body, UKFT reviews the portfolio of qualifications on offer, from entry to higher level. Working collaboratively with Awarding Organisations, UKFT will review course provision with the intention of recognising and promoting high-quality qualifications that will equip candidates with the skills to progress their career. 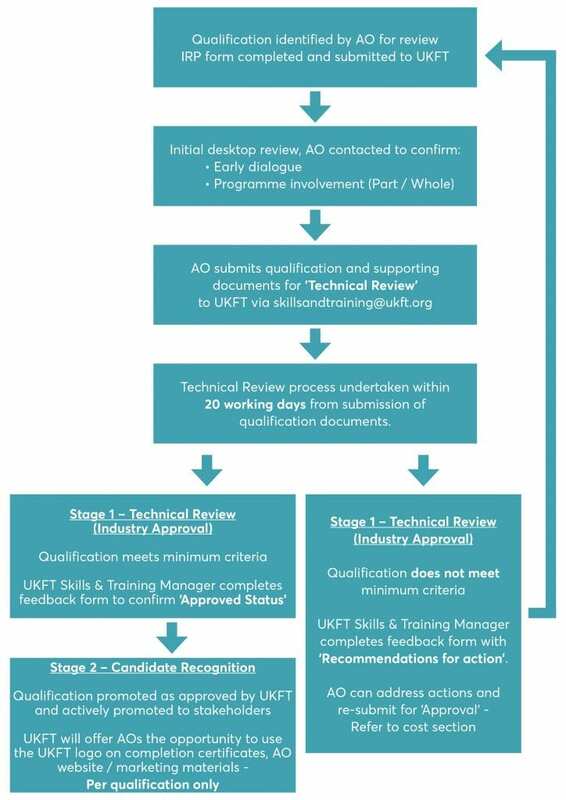 In response to sector requirements, the UKFT IRP relates to both the review of existing provision, as well as the development of new qualifications communicated through the UKFT Awarding Organisation Forum (AOF) and other UKFT channels. An outline of the stages of the IRP is below and full details can be found in the downloadable IRP documentation.